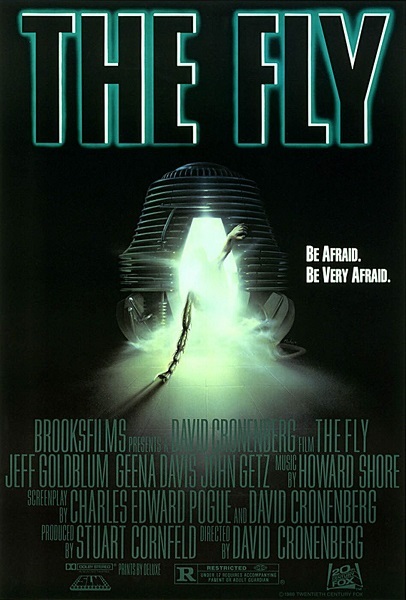 Corinne, Rosie, and Tim conduct a highly unscientific experiment by discussing David Cronenberg's gooey remake of The Fly from 1986. When not averting our eyes from the film's grotesque visuals, we discuss Jeff Goldblum's quirky and awkward performance as Seth Brundle, the disturbingly visceral make-up effects, and the film's surprisingly nonjudgmental stance on reproductive rights. Warning: Contains explicit language, spoilers, and acidic regurgitation. Care to rhapsodize about the poetry of the steak? Think the current election needs an insect candidate? Do you feel that's way too much sugar for one cup of coffee? Leave a comment and keep the discussion going. I need to revisit Cronenberg's The Fly, which I haven't seen since the 90s. My shock at that arm break still sticks with me. I did finally see Fly II a few years ago. It's not great, but there's enough there that I do like. I'm always compelled by stories where the person born a monster desperately wants to be anything but, yet ultimately gives in when others won't let him be anything else. I have seen the original trilogy. The first is arch with deeply dull stretches, but there's a great half hour in there and you can totally see why the plot hooked people. Part 2 is a cheaper production with a ridiculously giant fly mask, but a richer and more compellingly delivered story for my money. Part 3 deserves points for some genuinely disturbing body horror, but wastes it with a cheap, rushed production. Yeah, that arm-wrestling scene still makes me wince. I won't do well with compound fractures on film. It's been a while since I've seen The Fly II but I remember really liking the first half of the movie, with young Martin's accelerated development and the creepy idea of being literally raised by a company. After that it feels like Walas tries to outgross with the melting faces and that elevator bit. I still enjoy the first one. It's funny; Corinne and I were recently discussing movies that open with a pivotal scene from late in the story and then flash back to how we get there and how that decision has weakened some recent movies, but I think it really works there with the mystery of the apparently mad housewife. And Ben Nye's Fly mask still works. Return of the Fly I have trouble with due to a trope that I'm happy Curse of the Fly managed to avoid: the burden of trying to recreate the situation of the first movie so a sequel can exist. What are the odds the fly/human teleporter accident will happen the same way again? Cheap as it is, I dig that the third movie just deals with the consequences of those accidents and has some goopy ideas (the fused teleportation, the genetic degeneration) that make it feel like a b-movie forerunner to Cronenberg.